Glendale is a self-contained annex (located in the right hand side portion of the house in the main picture) overlooking Kallin Harbour and has been created following a complete refurbishment in 2007, having previously been "Glendale B&B" for 18 years. 'Glendale' self-catering is located at the mid-point of the circular road round the island of Grimsay with easy access to Benbecula, North and South Uist via the causeways which carry the main north-south road, making it a perfect base for exploring the Uists, Benbecula, Berneray and Eriskay. 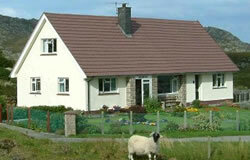 Glendale is not only situated in a very scenic area of the Uists it also boasts its own award-winning garden. A table and benches are provided to enable you to relax and enjoy the beauty of the garden. The accommodation comprises an en-suite bedroom, a living room, kitchen/dining room, utility room and shower & toilet room. At the front of the house is the kitchen and dining area which looks out onto the front garden, harbour, and the Minch beyond. An extensive range of kitchen facilities include a dishwasher, fridge/freezer, oven, microwave and washing machine / tumble dryer, table and chairs. Pots, pans, dishes cutlery etc. are provided for your use. Off the entrance hall is the living room which enjoys views of the back garden and Ronay. The living room is very comfortable with a TV, DVD player, VHS player, stereo, iPod docking station and a selection of local interest books, maps and film. There is a welcome folder which also includes local information including shop opening times, eating places, church services and much more. There is a shower room, including a toilet, adjoining the living room. A utility room containing a washing machine and tumble dryer is accessible from the entrance hall.